Brewing your own beer is a popular hobby and great fun for any brew aficionado, but for the very best results, you need the finest, freshest ingredients. 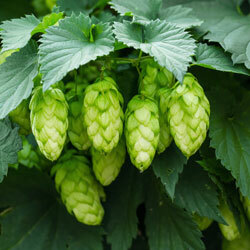 What better way to be sure of the quality of your hops than to grow your own right in your home garden? It’s easier than you may think! There are more than 120 varieties of hops available. To choose which type is best to grow at home, you first must consider your climate, soil type, sunlight levels and other factors that influence any plant in your garden. Once you know which hops are best for your region, consider the individual types and whether they are favored for bittering elements, aromatic qualities, overall flavor or just as decorative plantings. Not sure which types of hops you ought to choose? Visit your local nursery for a consultation, or contact a local home brewing group to connect with other home hops gardeners and learn more about the choices that work best for your area. All types of hops require well-drained soil and a spot in full sun to grow their very best. These plants tend to prefer soil with a pH ranging from 6-7.5 – purchase a soil test kit to learn your garden’s pH so you can add suitable amendments if needed to adjust the pH. You should also position hops where they can get adequate vertical support, since these climbing plants can reach 5-15 feet or taller, depending on the variety, and some hops will grow as high as 30 feet. They will need a strong, sturdy trellis, pole or other structure to support their growth and mature weight. In smaller yards or where vertical spaces aren’t practical, you can create a horizontal trellis to use after 8-10 feet of growth, and the plants can be easily trained to grow along the horizontal supports. Tall pulley systems can also help you grow taller hops varieties with ease. Once you are ready to plant your hops, choose only firm rhizomes that don’t show signs of bruising, rot or mildew. Your local nursery may have several types of rhizomes to choose from, or you can contact other local brewers about swapping or purchasing different rhizomes for a variety of hops. Because these plants are vigorous growers, a good fertilizer high in nitrogen will help promote leafy growth so they can thrive. As hops grow, they are also very thirsty and will require abundant water, but do not leave them soaking in puddles that will rot the roots. A drip system or soaker hose is best for watering hops consistently but without wetting the foliage, which can lead to foliar disease. Hops are particularly prone to downy and powdery mildew infestations. Trimming the lowest leaves will promote better air circulation and reduce the risk of mildew, and applying appropriate fungicides as needed may also be useful. While it is normal for the top portion of a hops plant to die off after the harvest, keep a close watch for any diseased shoots and prune them away immediately to prevent any infections from spreading. Keep your tools well-sharpened for clean cuts, and sterilize tools regularly to avoid any cross contamination of different pathogens. It may be 2-3 years before a new hops plant has grown enough to provide an abundant crop, but in time even a single plant can be a bountiful producer. When the cones have turned a rich, golden color and exude a pungent aroma, they are ready to harvest. Another clue is the texture – a ripe cone will have a dry, papery texture, and will be somewhat firm but spongy, returning to its original shape when gently squeezed. If the cone is mushy or the odor is rancid, the cone is overripe. Fortunately, because of the size of these plants, their cones ripen at different rates, and an ongoing harvest cycle is best to pick the cones at the peak of their ripeness. After harvest, hops can be used when they are fresh, or you can dry them for later brews. Experiment with different options to find which choice you like best, and you’ll be surprised at the difference in flavor and quality your own homegrown hops can make for all your favorite brews.